Rachel is 23 years old and is the first female President of the Students’ Union. Rachel has recently completed a degree in Event Management, graduating from the Uni in 2016. By being involved with Student Life, Rachel hopes to encourage students to share their experiences, tips and knowledge among other students, residents and businesses, along the Ipswich Waterfront which connects us. The University of Suffolk Students’ Union is an integral part of the University. It is a member led organisation, run by students for students. Every student that enrols at University will automatically be a member of the Students’ Union, that way, they can campaign on issues that directly affect the student body. The organisation exists to represent all students by voicing their interests and concerns locally, nationally and internally within the University. The Students’ Union is led by an elected President and Vice-President as well as part-time Department and Liberation Officers, all of who shape the direction of the Students’ Union for the year and based on the feedback they receive from students. Social activities, sports clubs and events are also a big part of the Students’ Union and these play an important part in University life and the student experience. In addition, the Students’ Union offers every student one to one advice in regards to matters such as housing, finance, academic appeals, wellbeing and sexual health. If you’re ever by the Students’ Union, feel free to pop in for a chat or pay a visit to the Campus Shop. As the University continues to grow, it is important to remember the local community that grows alongside us. Valued partnerships with local organisations, charities and individuals; particularly through events such as the Students’ Union Freshers fortnight which relies on the continued support from local businesses, are just some of the many reasons why the University of Suffolk is so great. 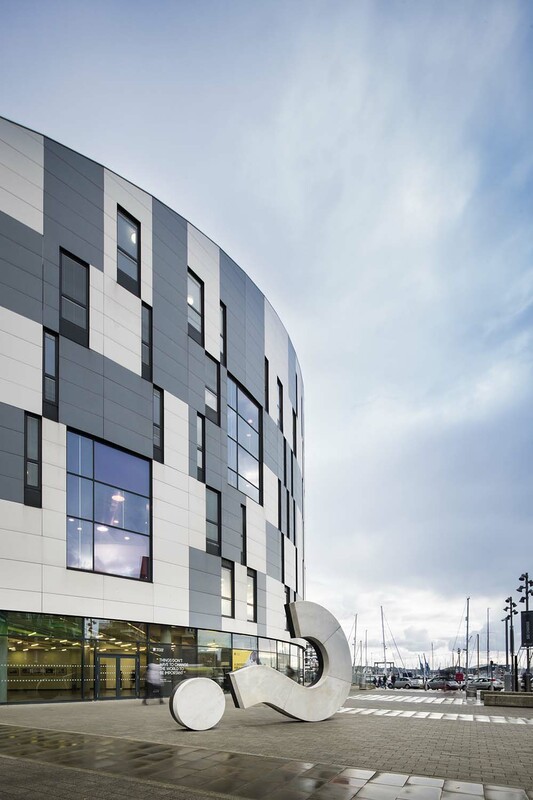 Based on the picturesque Waterfront in Ipswich, standing tall and proud in all of its glory, is the University of Suffolk. The University, one of the newest higher education institutions in the UK since it became independent in August 2015, lends itself to a unique and personal experience. Students are at the heart of what the University strives to achieve - a one of a kind student experience - whereby students are known by their names and not by numbers. While Ipswich may be the birth place and central hub, we have our four partner colleges who remain an important part of our identity. Together with Suffolk New College, West Suffolk College in Bury St Edmunds, Lowestoft College and Great Yarmouth College, we educate, mould and nurture over 5,000 students a year. The University, founded as University Campus Suffolk in 2007, has roots back in the Tudor era when Cardinal Wolsey established Cardinal College. It was Wolsey’s plan eventually to establish a college in Ipswich and now his dream has come true! As well as Academic departments, there are a number of Professional Services Departments whose job it is to make sure your University experience takes place without a hitch or niggle. While some of these services work behind the scenes, you can be sure to know that they really care about your feedback and overall experience. The University buildings have come on leaps and bounds since it was first established nearly 10 years ago and Ipswich now hosts five buildings, of which four are used regularly for teaching. In addition to the main Waterfront Building, the University has the James Heir Building which is situated along the Waterfront above Cult Café Bar and habitats a number of health and science labs and equipment; the Arts Building, which is home to budding film makers and fine art students to name but a few; the Library Building and its services - as well as the Students’ Union; and lastly the newest addition to the University, which is the Atrium. This building is shared with the Ipswich Waterfront Innovation Centre (IWIC) and has recently undergone a £5.5m makeover. To find out more visit the website at www.uos.ac.uk or why not come along to one of our events like an Open Lecture or to visit the Waterfront Gallery.